Home Public School Shakedown Is TFA Undermining Chicago Public Schools? Is TFA Undermining Chicago Public Schools? When news broke this summer that Teach for America was expanding its presence in Chicago amid the largest school closings in that city’s history and the layoffs of thousands of teachers and school staff, the reaction was swift, furious and extended well beyond the usual chorus of TFA detractors. At the time, I argued that the heated-back-and-forth, while welcome, missed the point. In city after city, TFA has largely abandoned its earlier mission of staffing hard-to-fill positions in public schools, serving instead as a placement agency for urban charters. In Chicago, however, TFA’s role appears to go far beyond providing labor for the fast-growing charter sector. 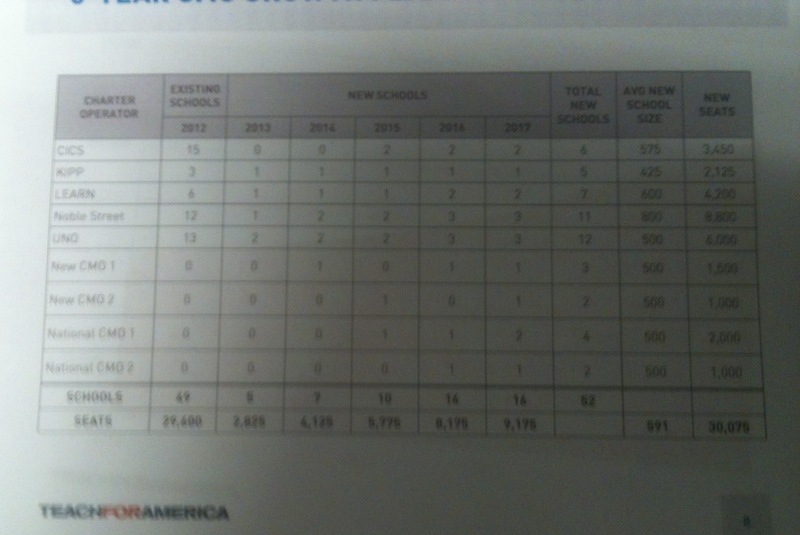 An internal TFA document indicates that the organization has a plan to dramatically expand the number of charter schools in the city. The document, a slide from Chicago TFA’s January 2013 Board of Directors meeting, is reproduced below. (You can view the original here or here). The five year charter management organization or CMO growth plan forecasts a dramatic expansion of privately-run charters in the city. The 52 new schools projected below would serve more than 30,000 students. This information raises some serious questions about the nature of TFA’s role in the growth of the charter sector in Chicago at the expense of traditional public schools, especially as TFA has contracts to provide corps members to teach in some of the same schools that are expanding. As you no doubt know, the opening of 52 additional charters will certainly mean more school closures. Can you explain TFA’s specific role in the push to open these charters? What I find most troubling about this is that TFA appears to have a “seat at the table” in determining the future shape of Chicago’s schools, yet parents don’t. Thanks for reaching out. As an organization, we’re strong advocates of high quality schools of all types, and, nationally more of our corps members work in traditional schools than in charters. We work hard to tailor our growth to community needs and are always looking into ways with our partners to expand great educational opportunities for our kids. This slide is a set of outdated projections from various high-quality charter networks in the city about their potential to grow if all the necessary conditions were present. Those conditions include, first and foremost, parent demand, and, then, things like authorization, access to affordable building space, sustainable public funding, access to private capital to assist with growth costs, etc., none of which Teach For America has any direct control over. We are a partner in providing them with one source of diverse teaching and school leadership talent for open positions. Given the recent school closures and all our education community has gone through since January, these projections would no doubt need to be significantly adjusted by the CMOs. Moving forward, we hope the conditions improve, so that high-quality schools of all types can expand and better meet the needs of our kids and families. Before taking any action, strong leaders ‐ be they in a board room, an operating room, or a classroom ‐ define the ultimate result they want, make clear how they will know they have succeeded and only then choose and design strategies to that end. 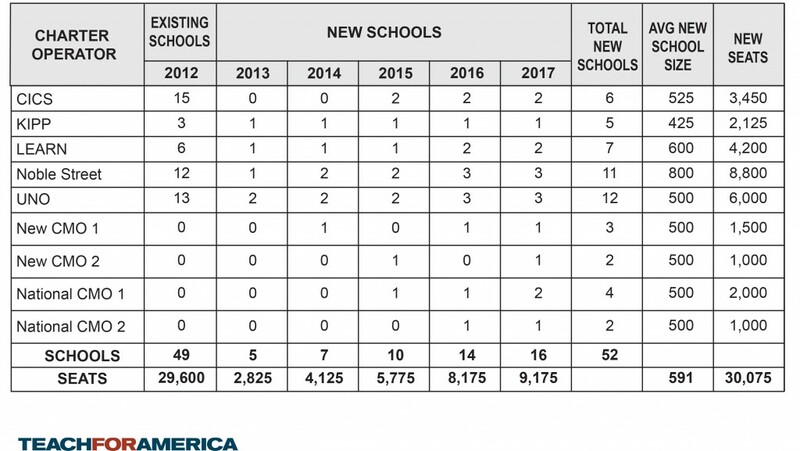 The “strong leaders” who met in the board room of Chicago TFA on January 13, 2013 defined their ultimate result: 52 new charter schools serving more than 30,000 students. Whether they get from “there to here” remains to be seen. Read more from Jennifer C. Berkshire. Send tips and comments to tips@edushyster.com. Journalist, blogger and cohost of the podcast 'Have You Heard,' about education in the time of Trump.